Hardcover. Hanover NH, Westholm Publications, 1st thus, 1963, Book: Very Good, Dust Jacket: Very Good, Hardcover, 86 pages, in a lightly worn dust jacket. 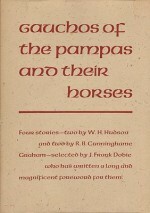 Four stories selected by J. Frank Dobie who wrote the Foreword. Limited to 400 copies.